While monarch butterflies spend the winter in the mountain forests of central Mexico, it’s a great time to prepare for their return to Wisconsin come spring. Wisconsin native milkweed and other native plant seeds require a prolonged period of cold before they can germinate and grow, said Caitlin Williamson from the Wisconsin Monarch Collaborative, a group of more than 40 federal and state agencies and nonprofit and business organizations. "The late fall months before we get a big snowfall is a great time to do it, either planting some of those native plant seeds directly onto the soil right ... or even with an inch or two of snow," she said. The seeds will take care of the rest, Williamson said. "They don't require a lot of maintenance and you know luckily for all the wildlife and monarchs and other pollinators that benefit, they spread pretty quickly," she said. 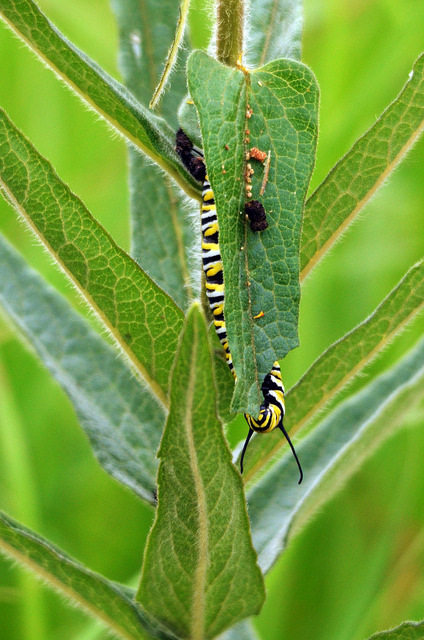 Monarchs cannot survive without milkweed — they lay their eggs on the plant and their larvae will only eat milkweed. But adult monarchs also need a slew of other native plants to feed. Nearly any native plant will help, but nectar plants like goldenrod, black-eyed Susans, coneflowers and blazing stars are best, Williamson said, also pointing to the Wisconsin Monarch Collaborative's list of the top 12 species to grow to help monarch populations. Don’t let garden space hold you back, Williamson said. Even a small patch makes a difference. "That's one of the most unique or special things about this conservation initiative with the monarch is that really everyone can make a difference ... whether you're in Madison or Milwaukee or have a back 40," she said. For a population that has declined by nearly 90 percent in just the last couple decades, every bit helps, Williamson said, noting that the U.S. Fish and Wildlife Service is expected to decide whether to place the monarch on the Endangered Species List in June of next year. "It's been really quite bad for the monarchs and the leading cause of that is the loss of their habitat," she said. While the collaboration is specifically aimed at monarchs, its efforts also extends to other species across the state. "What's great about monarchs, too, is that when you plant milkweed or other native plants you're benefiting not just the monarch but tons of other pollinators and insect species and bird species even," Williamson said. The group’s website also includes more specific guidelines on creating habitat in urban areas, farms, protected lands and right-of-way areas like highways.